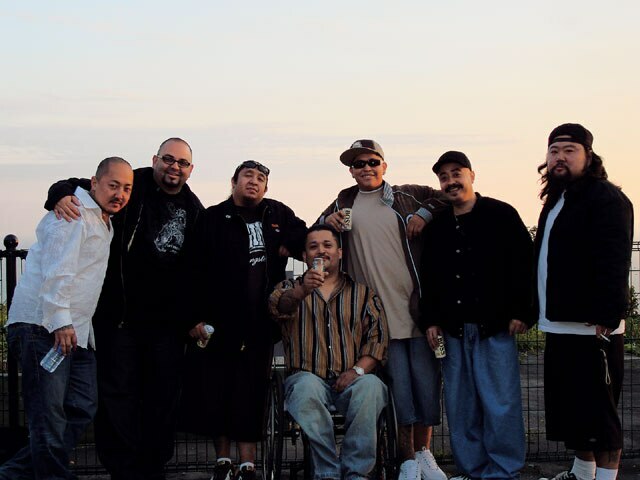 The Sun Rises For Far East Lowriders And Edgar's In The House, Camera In Hand. 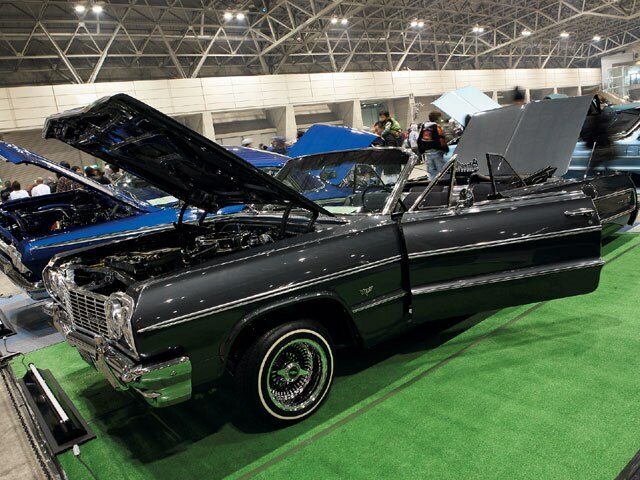 Just getting to the Japan Super Show this past Fall was quite an experience. Not only was there anticipation about going to another faraway land, but I had to figure out just how I was to spend my time on this long trip. I knew that I had to adjust to the differences in time and culture, and I felt that if I took one of those stiff drinks I would probably miss something exciting. That’s usually what I tell someone when they ask me “How was Japan?” Then I start going into details. So before I got all of my stuff together, I was getting anxious about visiting a new place that I’ve read so much about and nervous because I won’t be able to speak the language and be able to eat beans, carne asada and especially tortillas. It was a good thing that I had a bottle of Tapatio hot sauce at home which I threw into my luggage. 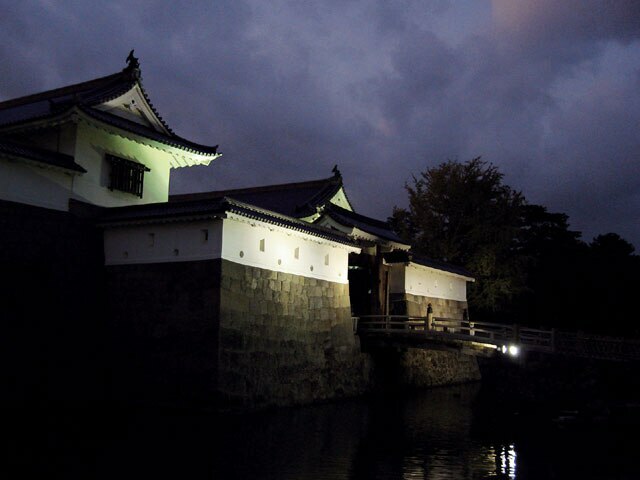 As the time to depart for the “Land of the Rising Sun” gets closer, I’m becoming even more anxious, so I do what sounds reasonable and take a few shots of tequila; okay, more like half a bottle of Patron. After a few hours, I’m awakened by my cell phone and the crew is asking where I’m at. I rush to get into my car and head to LAX, breaking all driving laws, including riding in the diamond lane by myself (okay, so that was a $375 ticket that I avoided that day). As I arrive at LAX, I’m greeted by some of the best tattoo artists in the industry-“Tattoo Tony” from Lifestyle C.C. 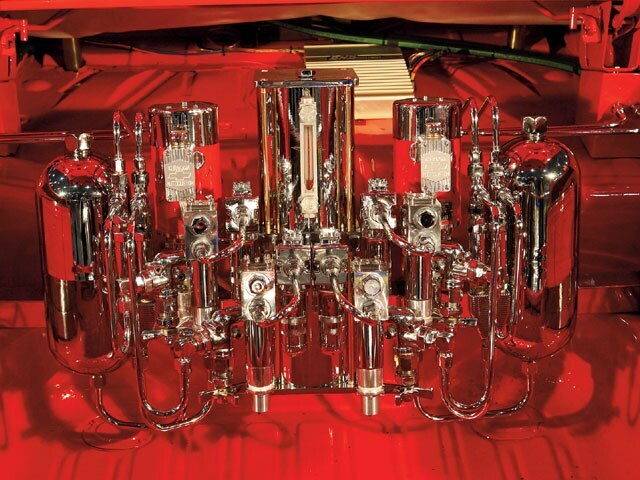 and Jose Lopez from Lowrider Tattoo in Fountain Valley, California. The 12-hour flight is not too bad after you down a bottle of NyQuil and fall asleep for eight of those hours, waking up to two meals that are accompanied by green tea ice cream. 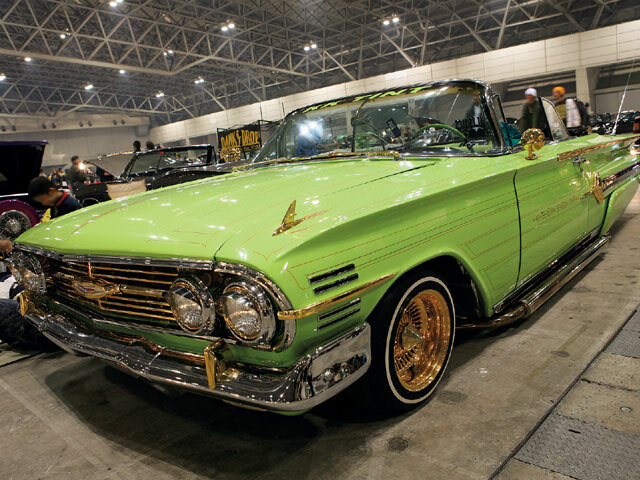 As we arrive in Tokyo we are greeted by “Krazy K” from Lowrider Tattoo in Japan. We all gather our luggage and squeeze into a van that’s meant to carry six, but there’s a total of nine, including Gustavo, “Spider” (nobody really knows his real name) and Karina, plus the people accompanying “K,” his girl, Tomo, and “Big Stone.” We make the two-hour drive to Shisioka, Japan, where we spend a few days before we head out to Shibuya, which is where we’re staying for our visit to the Lowrider Japan Super Show. On Sunday morning, after a long night of drinking in the streets of Shibuya where there are actually beer machines on the street like there are Coke machines in schools, I was awakened by Big Stone. Despite being tired, I was excited about attending the show. As we walk outside, we are hit by some rain. The cold weather isn’t helping the situation, but we arrive at the location, where we are greeted by our Japan homie “Big D,” who helps us get into the show without a problem. I’m amazed by the warm welcome that people give us as we walk the show and by people asking for pictures. They made sure that I was throwing out my “westside” sign. It was only fair that I took pictures of them also. 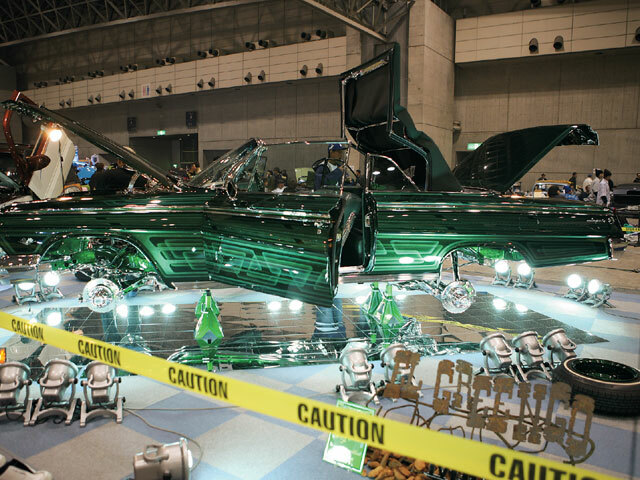 The show is also filled with chrome, candy and flake, as well as with a bunch of Japanese lowrider enthusiasts. 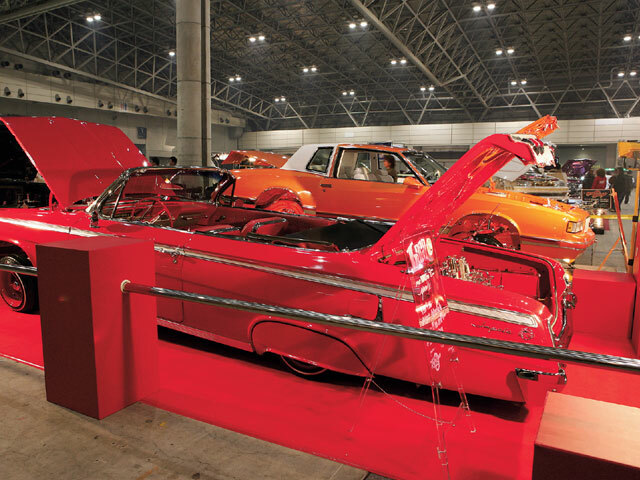 Walking the aisles, you can tell that the car owners pay attention to details, from the way that they display their cars to the way that they clean and take care of their prized possessions. I saw a homie cleaning his wire wheels with Q-tips, now that’s something that I’ve never seen before. Another thing that amazed me was when I saw a few guys wearing all blue, but then I saw them take pictures with some homies wearing all red, so I asked Big D what’s up with that and he explained that in Japan wearing colors is no big deal. He then went on to explain that it’s just a way of dress, like gothic or punk rock in the States. 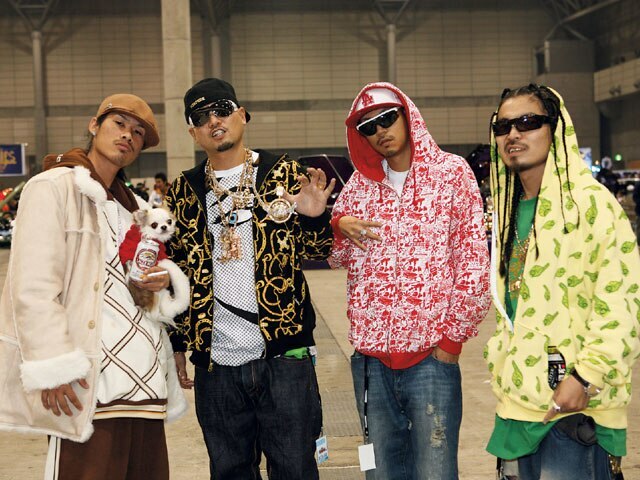 So dressing like a gangster, cholo or a thug is no big deal in Japan. 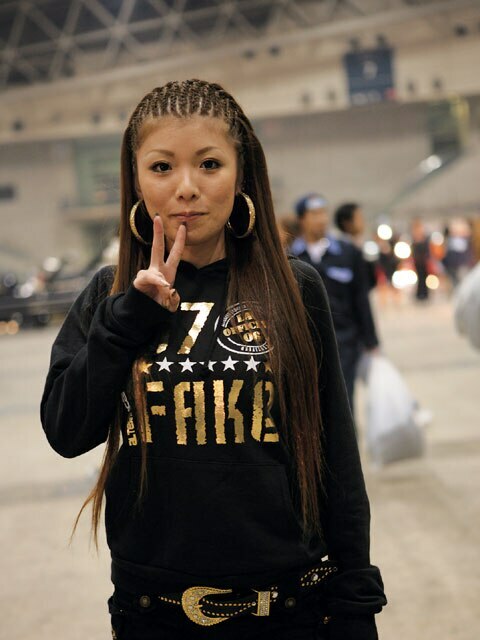 There was no disrespect from anyone, even when they throw hand signs. I guess it’s just the cool thing to do. And that should not come as a surprise since a lot of them know more Spanish words than they do English. As the hours go on, I was getting a little hungry so we head out to the cafeteria area where instead of having soggy nachos, hotdogs or some mystery meat, I was in heaven while I ordered a ground meat patty, some fried shrimp, fresh (and I do mean fresh) vegetables and a tall glass of beer. Beer? Yes, a cold Asahi. After this much needed break, I headed back to the show to capture more cars, people and displays, before returning home. 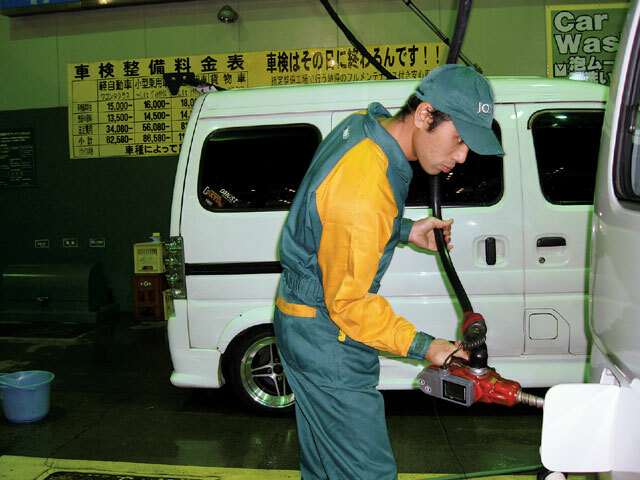 The entire experience at the Japan Super Show was more than a little strange. 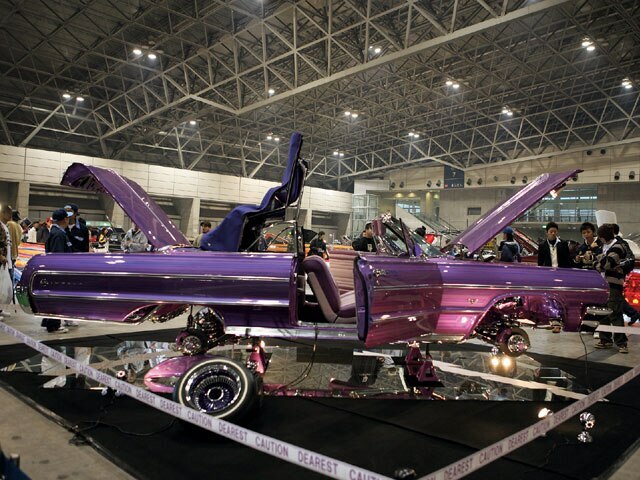 The Japanese lowriders are obviously serious and passionate about the sport. 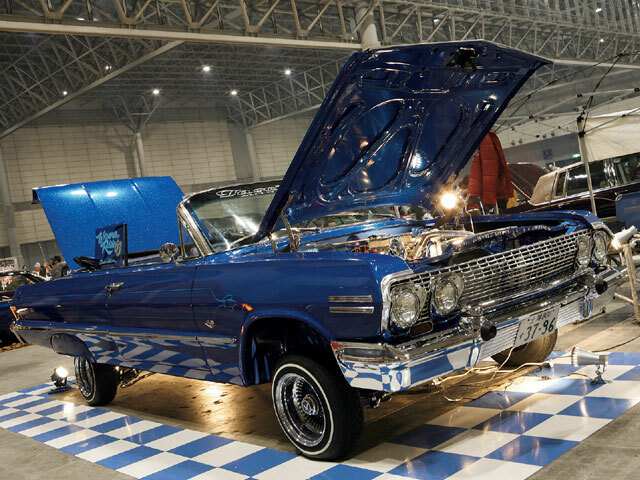 A decade ago, people here were just interpreting (and importing) what they saw in movies and magazines (like Lowrider), but these days they’re putting their own twists on the style with high-quality customs built right here in Japan. 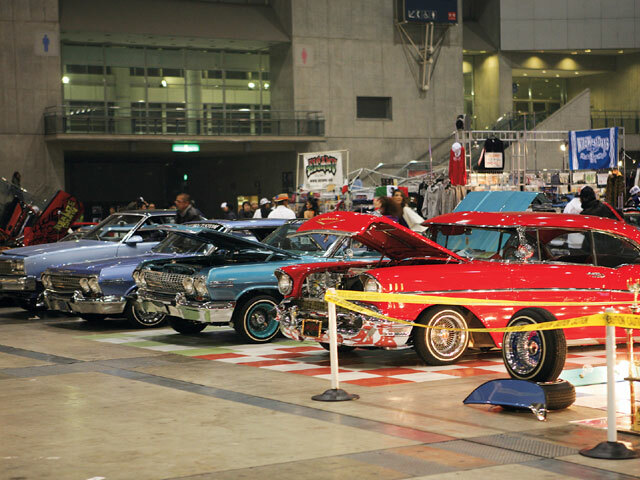 This may turn out to be the “Land of the Rising Lowrider.” Sayonara.